Backlog...................... @ Havregatan 20130111. Bottle from Systembolaget. Appearance: Brown colour with a beige head. Aroma: Liquorice, coffee, roasted malt. Body: Watery medium body, medium carbonation. Bottled (thanks omhper!). Ambery brown colour, small brown head. Aroma is coffee, some toasted and roasted notes along with liquorice and a quite big sprucelike touch to it. Flavour is ripe fruits, liquorice, tobacco, some spruce as well as mild minthe notes. As it warms up the flavour gets a bunch of blood and metal notes in it. Bottle from Systembolaget, bought in 2012. Almost black with a large tan head. Coffee, light roasted malt, licorice, some chocolate and notes of fruit. The finish had some sour notes. Not the best beer that I have tasted. Sample at SMÖF 2013. Very fruity smell, almost tart. Similar taste with some liqourice. Defenitely sour. Feels infected. Taste and smells like a bad homebrewn porter. There is some liqurice, coffee and chocolate. But there is something in both and taste that shouldn’t be there. Infected? Bottle. Pours a black color with a longlasting off-white head. 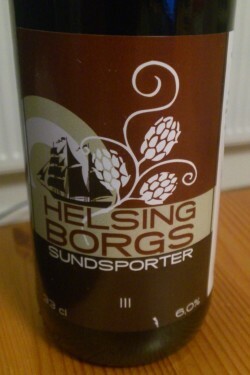 Has a roasted malty chocolate and caramel aroma with weak hints of smoke. Roasted malty caramel flavor with weak hints of chocolate. Has a fruity weak roasted malty caramel finish.